I switched from Smoothieboard to Duet 2 Wifi, but now I am having half the speed I used to have and motors are running HOT! I have 4 motors on Z axis, 2 motors on Y axis, 1 on X, and 1 for extruder. Well you have 1.7a motors and you're running them at 1.8 and even 2.2a. No wonder they are hot. How do they run if you set current to be about 70-85% of the rated max of 1.7? So 1200 to 1400. What voltage is your power supply? What is the model of the motor? Do you have a spec sheet for them? @cvmichael Increase your maximum instantaneous speed changes for X,Y and E. Also reduce your stepper current. And are the steps per mm for X and Y correct?. 80 seems about right for 16x micro stepping but you have set micro stepping to 8x. Without knowing more about the motors and pulleys etc, I can't be sure but it looks odd. That can only mean that you were running the motors at lower currents on Smoothieboard - which seems very likely because the drivers on Smoothieboard can't support the 2.2A current that you have set for Y in the M906 command. Also, if they are 1.7A motors, why are you running X at 1.8A, Y at 2.2A and Z at 1.8A? Running the motors a little over their rated current is OK, because the rated current is normally specified with both phases energised at that current, whereas microstepping drivers only apply the full peak current to one phase at a time. But running a 1.7A motor at 2.2A is definitely going too far IMO, and a 1.7A motor running at 1.8A is certain to get hot. When you were using Smoothieboard, did you also have the motors connected in series? Or perhaps you connected them in parallel instead? That would explain why you have the currents set so high. 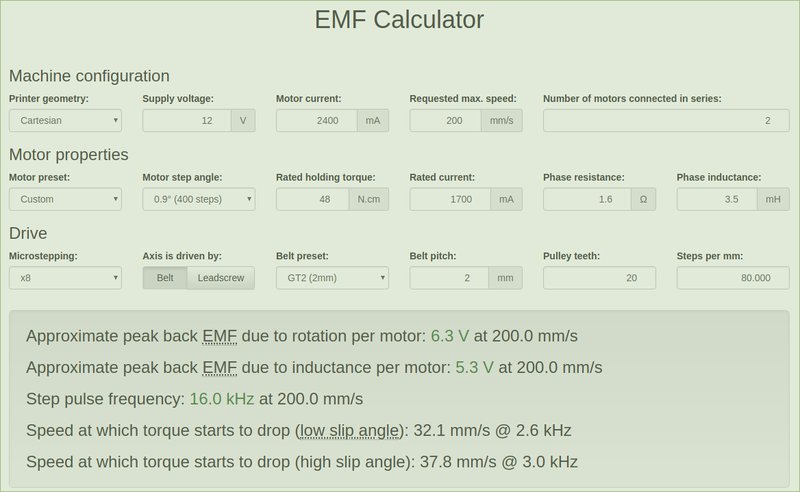 Use the EMF calculator at https://reprapfirmware.org/ to work out the maximum speed you can get before torque starts to drop. 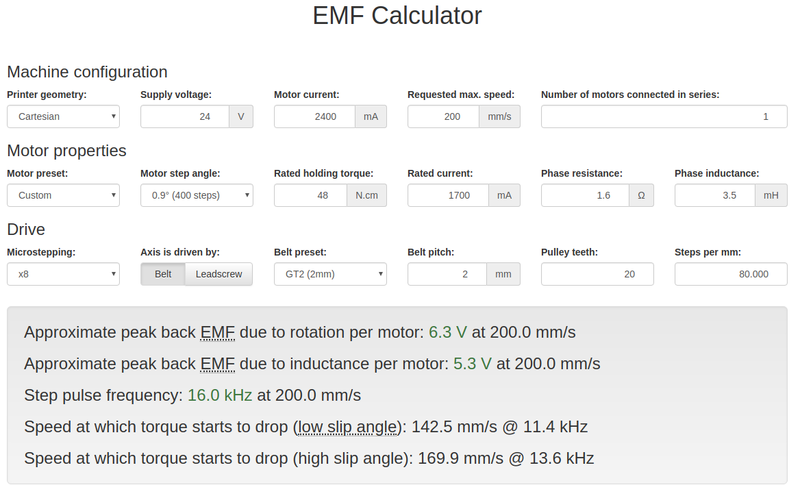 Note, this is lower when using series-connected motors then when using single motors or parallel-connected motors. What do I have to change to get more speed? I am thinking to connect the expansion board at 24V. Is it possible to connect the main Duet 2 Wifi board at 12V, and the expansion board Duex5 at 24V? Fair enough - I missed that you were using 0.9 degree motors. BTW, the machine will likely run a lot quieter if you use 16X with interpolation and 160 steps per mm. You have another problem in your system for sure. Steppers are current controlled, so putting them in series does not require to touch the current. The voltage required for that current increases, but that's controller's job. Not your case, but I am running a small CoreXY with 80 steps/mm and 1.8 deg motors at 12V and it can easily reach 500mm/sec in XY plane. The current is set at 900mA. The motor is 17HD40005-22B, which is advertised as 1.3A motor. As @deckingman said without more details and/or pictures, we cannot know what is wrong. Maybe the friction is too much to be handled by the motors. 24V will clearly increase your top speed. Are you sure that Smoothie really got to 50000mm/min in the same exact setup? Because in theory TMC drivers in Duet are better than DRV8825. Steppers are current controlled, so putting them in series does not require to touch the current. The voltage required for that current increases, but that's controller's job. If you connect the motors in parallel, you will have to accept less torque at low speeds (because the current you set will be shared between the motors, so the maximum will be 1.2A each), but you will get more torque at high speeds. It's common to run 1.7A motors at currents as low as 1A (so 2A for two in parallel), or even 0.8A. If you were getting missed steps at lower currents, are you sure that you don't have the accelerations in the M203 command in config.g set too high? Did you use the same values on the Smoothieboard? Did you make any other changes to the printer at the same time as changing the Smoothieboard for a Duet? The firmware assumes that the Duet and DueX boards use the same VIN power, because it uses the VIN voltage monitor on the Duet to determine when all the TMC2660 drivers need to be initialised, including the ones on the DueX. @cvmichael I am 100% positive you were never getting 50,000mm/min with Smoothieware and that hardware setup. Some firmware limit was keeping you way below that speed. Might have been a cap on step pulse frequency, or a queue depth limit (since Smoothie never exceeds a speed it can decelerate to 0 from during an E-stop), or some other setting. 0.9 degree steppers wired in series on 12v absolutely cannot run fast. Each motor is only getting effectively 6v when you do that. There is not enough voltage being applied to each coil to overcome inductance and back-emf at high speeds. On the microstepping note, you never LOSE torque by using finer microstepping. Microstepping can only help until you go so fast you hit a firmware step pulse generation frequency limit. This is a commonly misunderstood issue. It's true that each individual microstep provides less torque with finer microstepping, but at the same time you take proportionately more microsteps, and the torque is additive, so finer microstepping ends up being the same running performance for the motor. 1/32-stepping: Quieter than 1/16th but diminishing returns kick in for smoothness and resolution. This is typically the finest microstep size where the human eye will see an improvement in print quality in a very well-tuned Delta. 1/64, 1/128, 1/256: Continuing reduction in audible noise, no other meaningful impact. The one big caveat here is that if you run high speeds with a high steps/mm level, most 3D printer firmwares will start firing multiple step pulses at a time to keep up with the step pulse generation frequency requirements. This effectively coarsens your microstep size dynamically at higher speeds. For example, 8-bit Marlin on RAMPS can only fire the stepper interrupt at 10 kHz, so if you need to fire 10,002 step pulses at 1/16th microstepping per second, it will actually fire 5,001 double-pulses which effectively outputs 1/8th microsteps. Likewise if you hit 20,004 steps per second it will fire 5,001 quad-pulses. RepRapFirmware will go up to octostepping at very high speeds, meaning if you're trying to do 1/8th steps, you could actually get full-steps. That's generally fine because inductance and back-emf at high speeds screw up the current waveform so much that microstepping doesn't really work anyway. It's all basically full-stepping once you get going fast enough, but that typically happens beyond the resonant frequencies for the motor so it doesn't matter much. That's all correct, except that in the last few firmware revisions, although the firmware may still switch to calculating the step pulse interval very 2, 4 or 8 steps, it continues to send the step pulses at uniform intervals. I made this change because step-servo drives don't like double and higher stepping, it upsets their motion calculations. I bought the Duex5, connected it to a 24V power supply, and now everything is working at normal speeds. At first it was not going beyond 15000 mm/min, I googled a little bit, and removed T15 from M569, and now it's going at full speed! Question: The extruders are now all on the Duet Wifi, setup as E0:1:2:3:4 - Do I have to specify everywhere 5 times the same values? Like "M906 E1500:1500:1500:1500:1500" or does it apply to all 5 if I put it only once? "M906 E1500"
You can do either. If you provide just one value, it will be applied to all extruder drives. If all your extruders are the same then it's probably only the M92 value that you need to customise individually.